Why this comparison? They are both lightweight inertia action field guns, used for similar applications. Browning 5 lbs., 14 oz. Browning's center bead obscured the front bead and was extracted. Benelli's center bead also completely obscures the front bead, and was broken off. Browning's speed-loading gives Browning the edge. The Browning is also very easy to load, where the Benelli thumb was a real problem for the M2 and was partially fixed by Benelli Customer Service, who took a hammer to the shell stop. 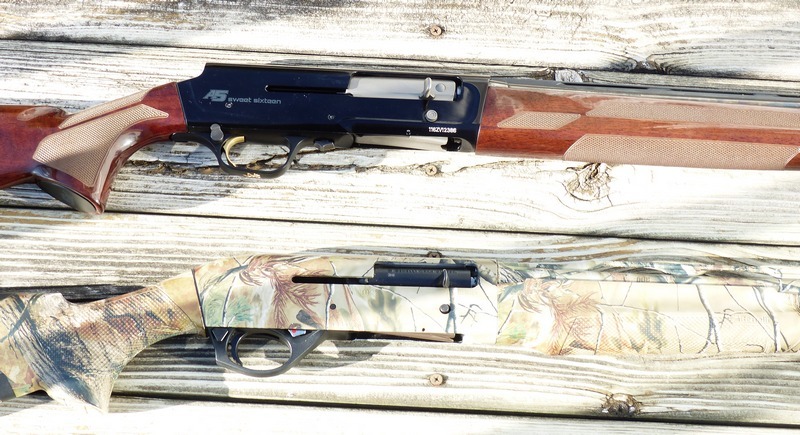 Browning's walnut and polished blue tramples the look of Benelli's plastic stock with camo. Available from Browning, not included. Browning does include spacers to lengthen the length of pull. Benelli includes shims, but does not include spacers for stock length, nor are they available. Unhappy with Benelli factory choke tubes, it was Trulock Precision Hunter extended tubes to the rescue. Unhappy with the supplied Browning tubes, Invector-DS Improved Modified and Light Full tubes are available. Patterning tests are to follow, but the Invector-DS Improved Modified choke measures .646 inch for a .023 inch constriction and that should take care the open patterns I initially objected to quite nicely. The Benelli Saga has been completed: http://www.randywakeman.com/ItisaGreatShotgunEventually.htm . The Browning Saga is just beginning: http://www.randywakeman.com/REVIEW2016BrowningSweetSixteenPartOne.htm . Both Browning and Benelli are well-recognized nameplates, with the Browning “Buckmark” being more influential. As you can see from the above basic comparisons, neither the Benelli nor the Browning are priced at the bargain-basement entry level. Surprisingly, both guns were supplied with very similar issues: center bead, trigger, and room for improvement in the supplied choke tubes. We can't move very far along into this without a treatment of 20 gauge vs. 16 gauge, as the A5 Sweet Sixteen is not available in 20 gauge, nor is the Benelli (or much of anything else) available in 16 gauge. Actually, there are some. Many people find the “dinky yellow shells” of the 20 gauge hard to handle, particularly with cold or gloved hands, than the 16 gauge. On top of that, the Sweet Sixteen specifically is smoother and quicker to load, and with “Speed-Loading,” is an easy winner in the shell-handling department. The 2-3/4 inch chamber of the 16 gauge, mated to 2-3/4 inch unfolded length hulls, promises a higher pattern efficiency with the same constriction of choke. As Jack O'Connor and others pointed up, the 16 gauge was at one time the second most popular gauge, going back to the time where the number one upland game animal was the rabbit. Soft iron aka “steel” shot was not foreseeable, and the “power of the gauge” was payload related. The Winchester Model 21 introduced the three inch 20 gauge shell that was made available to the public in 1954 as the "Western Super-X Magnum." It was the days of President Eisenhower when the three inch 20 appeared; this was before the U.S. had an interstate highway system approved (Federal-Aid Highway Act of 1956), much less built. Remington didn’t introduce plastic shotshell hulls until 1960; with injection mold and plastics technology primitive compared to what is available today. In all of these years the 20 gauge that once featured was a “high brass” lead payload of 1 oz. has been improved to where 1-5/16 oz. lead loads are common, Hornady offers a 1-3/8 oz. lead load, and Federal makes a superb 20 gauge turkey load, 1-1/2 oz. of Federal Heavyweight #7. At the same time, 16 gauge loads have not seen the load development of the 20 gauge, and the 3 inch chamber used in 12 gauge, 20 gauge, and .410 bore was never generally launched in 16 gauge. Shotshell introduction has been at a comparative standstill since 1988. 1988 was the year that Mossberg introduced the 3-1/2 inch 12 gauge and Federal Ammunition introduced 3-1/2 inch unfolded length shotshells to go along with it. While 16 gauge shells have always been available, for the most part the 16 gauge user has been stuck with 1 oz. of #8 lead shot or 1-1/8 oz. of #6 lead at the local big box stores. There are some loads currently of interest: the blazingly fast (1425 fps) P163 Federal Wing-Shok buffered 1-1/8 oz load, and the P165 1260 fps buffered 1-1/4 oz. Federal “Wing-Shok” Magnum available in #4 or #6 lead shot only. I'll work with those on the patterning board for starters, to see how close we can get to some of the better 20 gauge pheasant loads I've been working with for years. Kent does offer a 1 oz. Bismuth load at 1300 fps for the 16 gauge, new this year as well. The Benelli has the wider ammunition choices associated with the 20 gauge, and is also available in a left-handed version. The Comfortech stock on the M2 does scale well with recoil, adding some noticeable relief compared to a conventional stock when using 1-1/4 oz. to 1-5/16 oz. lead loads, the loads I've been using out of it for the last few years on wild pheasants. Fit and general handling qualities are personal things, of course, but certainly the A5 Sweet Sixteen gives up no ground in the “fun to carry” component, as it is slightly lighter than the M2 and most other 20 gauges for that matter: yet the compared shotguns here are a 24 inch barreled M2 and a 28 inch Sweet Sixteen, but the A5 is still lighter. While the days of steel receivers on autoloaders are numbered, it is still refreshing to me to have blued steel and walnut and a bit less plastic involved with trigger guards and the like. Though of no functional concern, visible mold lines on plastic trigger guards are still a bit hard to swallow on somewhat upscale priced self-loading shotguns, as are the cheap molded in swivel studs that are commonplace. I've spend some time discussing factory choke performance. It sure is enlightening to pattern shotguns, so while I have scolded Browning on their DS choke tube constrictions, it is only fair to note that the factory Benelli M2 “Improved Cylinder” choke tube has only .004 in. of constriction, and hardly patterns much differently than a cylinder bore. Over the last six years, I've used the Benelli M2 20 gauge to drop more wild pheasants than any other shotgun. Nevertheless, the Sweet Sixteen is more appealing on several levels and there hasn't really been a properly weighted and balanced sixteen gauge alternative in an autoloader until now. The old 1-1/8 oz. 2-3/4 inch 20 gauge load used to be fairly popular, Federal still offers the P256 load in #4 and #6 shot. With the default of a three inch chamber in 20 gauge hunting guns, that specific load has understandably lost a portion of its appeal. There is no reason that 1-1/4 oz. to 1-5/16 oz. 16 gauge lead loads aren't available except for the low demand for them. Perhaps the Sweet Sixteen will motivate ammo companies to give the gauge more attention, we will have to see. Browning does indeed deserve great credit for keeping the 16 gauge alive, a fairly daring product offering in a somewhat conservative field. More to follow in Part Two of this comparison, but for the reasons cited here, the more time I spend with the Sweet Sixteen, the more appealing it has become.